Origanol Strong is recommended in cases of respiratory, gastrointestinal, urinary and reproductive system infections and skin infections, as well as in cases of weakened immune system. Origanol Strong is a superior organic product which contains organic oil of wild oregano (Origanum minutiflorum), extra-virgin, cold-pressed, unrefined, organic olive oil (Olea europaea) and organic fish gelatine (suitable for use in certain religious communities). 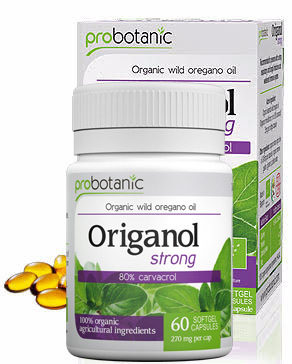 Origanol Strong is intended to all those who with difficulty bear the drinking of wild oregano oil. In a comfortable and pleasant manner without prickling sensation, pungency and associated symptoms, you can consume the oil of wild oregano and enjoy in its therapeutic effects. Origanol Strong oil of wild oregano will always be at hand because you can carry it with you anywhere. It is suitable for use in children older than six years. Other ingredients: Organic extra-virgin olive oil, organic fish gelatine, glycerol, purified water. Adults and children older than 12 years (for therapeutic purpose): 1 soft gel capsule 3 times a day after a meal with one glass of water, for, 20 days. Adults and children older than 12 (as prevention): 1 soft gel capsule 3 times a day, after meal with a glass of water, for 10 days. Warning: The product is not recommended to pregnant women, breastfeeding mothers and children younger than 6 years of age, or persons sensitive to any of the product’s ingredients. The product may not be used by persons suffering from: anaemia, coagulation disorder, swallowing disorder, severe hypertension, severe damage of liver and kidneys, and persons taking anticoagulation therapy. Potential side effects of the product are: slow absorption of iron from bowels, short lasting and temporarily increased heart rate and irregular heart beat (in persons sensitive to spicy food), burning sensation in mouth and stomach, increased menstrual bleeding. Note: The product cannot replace diversified and balanced diet. Read the instructions prior to use. Storage: Store in a dry and dark place, at room temperature, out of reach of children. Lot number and expiration date are indicated on the product’s package and label. Approved by the Ministry of Health of the Republic of Serbia by decision number 6505/2015 dated 24 February 2015. Softgel capsules are made of fish gelatine.